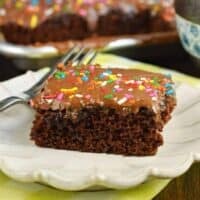 Easy one bowl Chocolate Buttermilk Sheet Cake recipe. 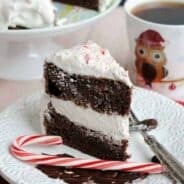 Fudgy buttermilk frosting on top! Perfect for a crowd, or freeze for later. 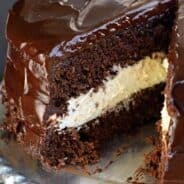 I loved the fudgy texture of that sheet cake with it’s soft, decadent melted icing on top! I wanted to create a similar treat, my biggest struggle was trying to find the right pan size for the job. My first attempt was using this recipe…no pan size listed (well, it did say jelly roll) and temperature says 350-375. Needless to say it overflowed into my oven in a giant mess. One would think I would have given up…but no way. I used my half sheet pan from making these Almond Bars and went back to work. SUCCESS. 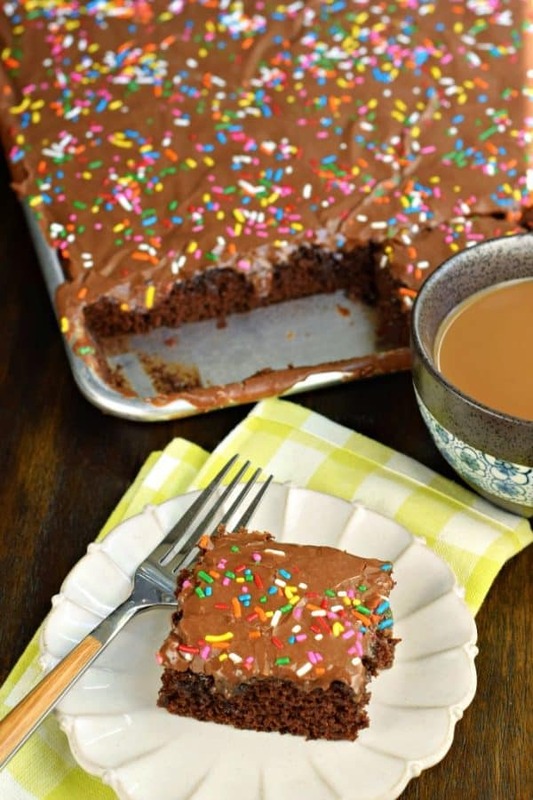 The key to this sheet cake is the buttermilk. Don’t you dare even think about skipping it! It’s in the frosting too, so you get a double dose of deliciousness. 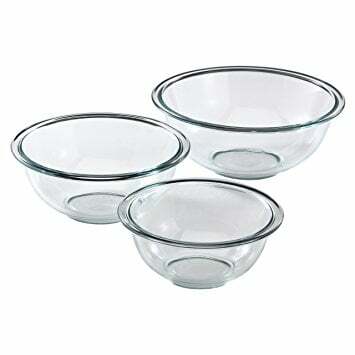 All you need is one bowl to mix the dry ingredients together. Add in the eggs, oil, buttermilk and hot water. Combine really well then pour into your sheet pan. I used this one. Bake in a 350 degree F oven for about 25 minutes, until edges separate from pan and toothpick inserted in center comes out clean. Remove from oven to cool. While cake is cooling, prepare frosting. 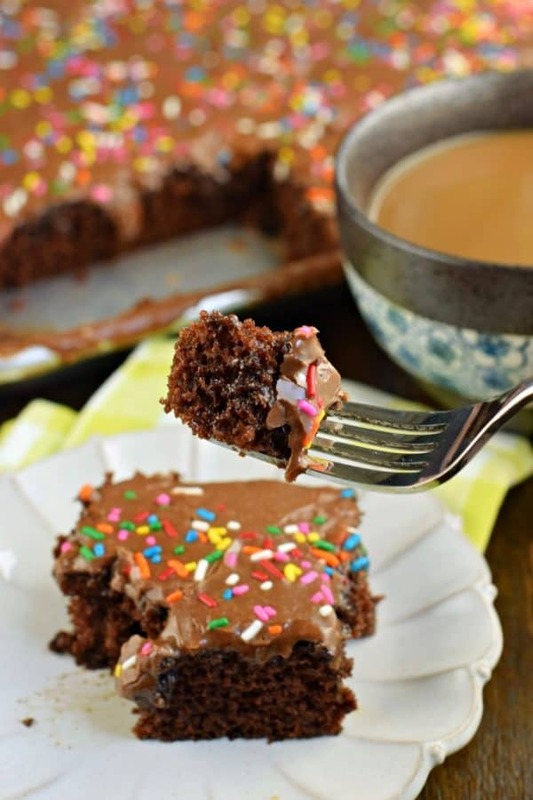 Pour over cake (it’s okay if cake is still warm!). Add sprinkles if desired. Cool cake completely and let frosting set (about an hour). Slice and enjoy. If freezing, place cake slices in airtight container in layers separated by wax paper. Freeze until ready to use. Thaw at room temperature and enjoy. 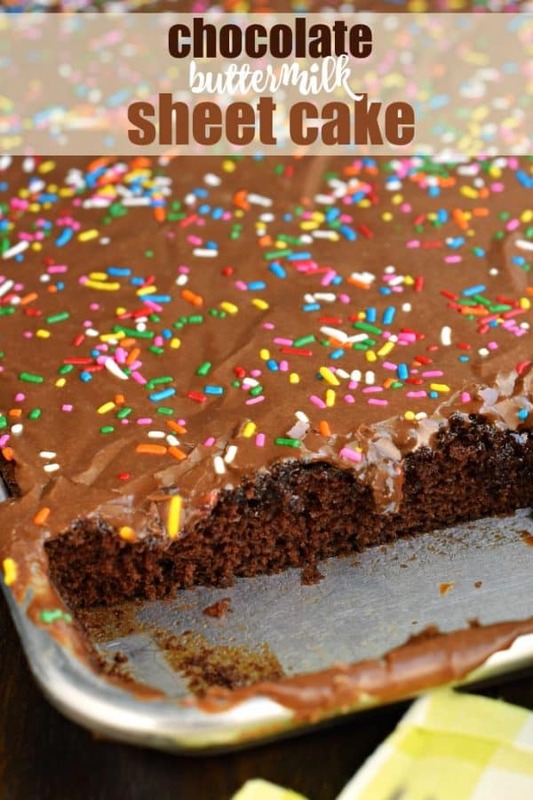 Q: What is a texas sheet cake? A: Texas sheet cakes are typically made in large rectangular pans for a crowd, sometimes called jelly roll pans. This recipes uses pans sized approximately 18×13-inches. 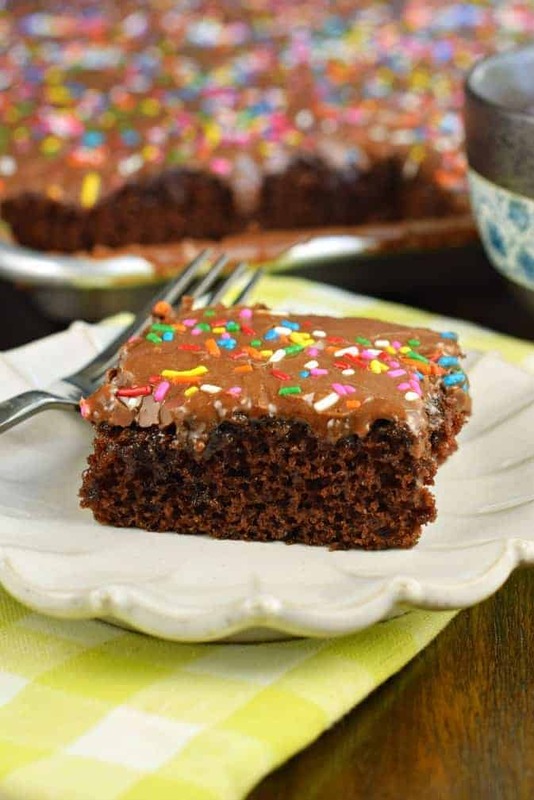 The cake is made in one bowl and is a single layer cake with a fudgy icing. Here’s the pan on Amazon that I used. Q: Does chocolate sheet cake need to be refrigerated? A: Cakes that have an icing made with butter, cream cheese, or whipped cream technically SHOULD be refrigerated. I personally leave mine out on the counter in an airtight container, so do what makes you feel comfortable! Q: Can sheet cakes be frozen? A: YES! Once the icing has hardened and set, and the cake is completely cooled, slice into portions. Using an airtight container, place pieces of cake in layers separated by wax paper. Freeze. When ready to enjoy, remove from freezer and allow to thaw at room temperature. Q: What can I use if I don’t have buttermilk? A: First, for the future, I like to keep a can of this powdered buttermilk on hand. It’s so easy to use and has a long shelf life. Add the powder in with your dry ingredients, and the water with the liquids, the ratios are on the container. Second, if you don’t have any buttermilk, you can make your own using milk and lemon juice. Add 1 Tbsp of lemon juice to a measuring cup and add enough milk to reach 1 cup. Stir and let sit for 5 minutes. Easy and delicious, these chewy Cinnamon Frosted Zucchini Cake Bars are the perfect sweet dessert any time of year! Serve chilled for extra flavor! Turn your favorite Gooey Butter Cake into a Lemon dessert! Gooey Lemon Cake Bars will make you quite happy, and nobody has to know you started with a mix! These Apple Cake Bars from Texanerin Baking are super moist and full of cinnamon apple goodness! 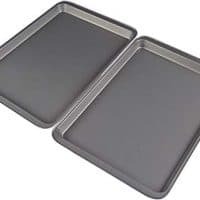 Preheat oven to 350 degree F. Spray half sheet pan (size approximately 18x13-inches, I use this one from Amazon) with baking spray. Set aside. For the cake, in a large bowl, combine the sugar, cocoa, flour, baking powder, baking soda and salt. Mix until blended. Add in the eggs, oil, buttermilk, and hot water. Whisk together until fully combined. Pour into prepared baking sheet. Bake for 25 minutes, until edges pull away from the pan and a toothpick inserted into the center comes out clean. Remove from oven and cool. While cake is cooling, prepare chocolate icing. In a small saucepan, combine the butter, buttermilk, and cocoa powder. Whisk until smooth over medium high heat. Bring to a boil, and remove from heat as soon as it boils. 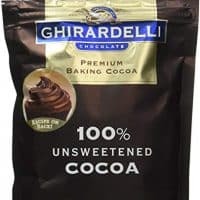 Pour chocolate mixture into a mixing bowl and add in the powdered sugar. Beat until smooth. Pour over cake (it's okay if the cake isn't completely cooled). Add sprinkles. To freeze, once the icing has hardened and set, and the cake is completely cooled, slice into portions. Using an airtight container, place pieces of cake in layers separated by wax paper. Freeze. When ready to enjoy, remove from freezer and allow to thaw at room temperature. Your recipe sounds amazing! 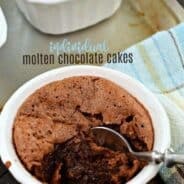 May this recipe be cut in half and made in a 9×13 pan or as cupcakes?